The man police want to question. THE owner of an Osborne Park gym was the victim of blackmail on March 21. About 10am on March 21, a man attended the gym and asked to speak with the owner. The owner of the gym was ushered out the back door into the carpark and towards the rear of a vehicle where he was surrounded by three other men. He was handed a document detailing he allegedly owed them a large sum of money and was threatened to sign it. 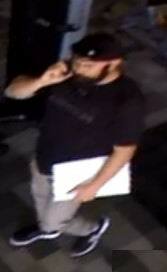 Police have released a CCTV image of a man who they believe can assist with their inquiries. The man is described as having light skin, 40-45 years old, of a solid build, about 180 cm tall and a dark-coloured beard. At the time of the incident, he was wearing a dark coloured short-sleeved shirt, long pants and black runners with a white sole. If you know the identity of this person or have any information call Crime Stoppers on 1800 333 000 and quote reference number 8211.